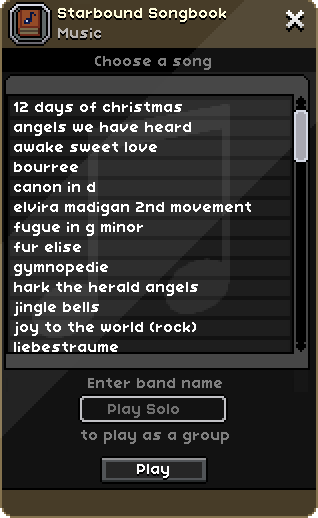 For the background music played during gameplay, see Music Tracks. Music is a game mechanic that allows the player to play songs using instruments. Songs can be imported into the game using ABC notation. This allows players the ability to share songs, or search for songs others have composed online. Instrument usage has no effect on ongoing game music; however, notes made by instruments are categorized as sound effects rather than as music, so muting the game's music does not mute music produced by instruments. Instruments are items that can be used to play songs. They produce unique sounds when played, and the same song can be played using different instruments. Some songs may even be intended to be played on a specific instrument. There are a large number of different varieties of instruments (listed below). Tiy stated in a stream that they intend to give each race a unique instrument as well. Instruments can be acquired through a variety of means. Tenants have a 0.5% chance of giving an instrument as a gift, chests have around a 1% chance of containing an instrument, quests have a 3% to 5% chance, challenge rooms have around a 5% chance, and the rare golden chests in the fossils mini-game have a 10% chance of containing an instrument. In multiplayer, different players can play different instruments together to play songs as a band. Below are all the instruments in game to date. Accordion An accordion. Get those arms working! Acoustic Guitar An acoustic guitar. Perfect for campfire songs. Banjo A banjo. Get ready to duel! Bass Guitar A bass guitar. Lay down some rhythm. Bright Piano A bright-sounding piano. Great for performing more upbeat songs! Clarinet A clarinet. Try not to squeak. Drum Kit A drum kit. Better warn the neighbours. Electric Bass Guitar An electric bass guitar. Lay down some rhythm. Floran Bone Xylophone A bone xylophone. Produces a killer sound. Flute A flute. But is it magic? Hammered Dulcimer A hammered dulcimer. Bash out a tune. Harmonica A harmonica. Favourite instrument of grizzled space captains. A microphone. For all the soulful divas out there. Koto A koto. For that oriental sound. Lead Guitar A lead guitar. For those who like to showboat. A microphone. How low can you go? Music Box A music box. Is this a wind-up? Nylon Guitar A nylon guitar. It gently weeps. Oboe An oboe. It's pretty dusty. Ocarina An ocarina. Make sure you have time to practice. Overdrive Guitar A guitar. For those who like distortion. Piano A piano. Truly a key instrument. Reed Organ A reed organ. Don't blow this performance. Rock Organ A rock organ. A real stadium-filler. Saxophone A saxophone. For when you've got the space blues. Steel Drum A steel drum. Let's make some noise. Space Synth Far out, man. Square Wave Perfect for adding that synthetic feeling to your performance. Trumpet A trumpet. Try not to blow your own horn. Violin A violin. Don't bow out just yet. Starbound uses .abc files to play music. Search online for .abc compositions to add in game! Place the file into the \songs folder, you may need to restart after adding them there. This page was last modified on 26 July 2018, at 02:09.